Imagine the most amazing cinnamon roll you’ve ever seen. It’s HUGE, covered in icing, and the aroma rising from it invigorates your senses. It’s perfectly shaped, perfectly baked, and if you don’t put in your mouth in the next minute, you’re going to lose your mind. My favorite part of a cinnamon roll is the very middle. It usually constitutes one big bite – that perfectly round center that’s soft, chewy, and the basin for all the wonderful flavors the cinnamon roll contains. I enjoy every other bite of the pastry as well, but in my heart, I know each bite I take will get better and better until I reach that much desired center. You know what else is like a cinnamon roll? Deliverance from a stronghold. What is a stronghold, you ask? Anything that creates an obstruction between you and God. And, there’s a reason the word strong is in the word stronghold. Whatever the stronghold may be, it’s stubborn and doesn’t want to leave you alone. It wants to keep your focus away from God. You’re probably wondering what this has to do with a cinnamon roll, but hear me out. Picture that perfect cinnamon roll again. Ok, the sought after center of the pastry is deliverance. Deliverance is sweeter than sweet. It’s that place where the stronghold no longer has control over you. Now, the outside of the cinnamon roll is the path on which God leads you on your way to deliverance. He leads you step by step, peeling back the layers of that stronghold until you reach that golden center. So, just how do you get on this path toward deliverance and how in the world do you actually get delivered? Call on Jesus. Yes, the Lord of Lords can surely deliver you. Strongholds come in many different forms, but God can deliver you from any and all of them! He wants to deliver you because He loves you, He wants the best for you, and He doesn’t want there to be any obstruction between you and Him. That cinnamon roll of deliverance is awaiting you. All you have to do is ask the Lord to deliver you from your strongholds, whatever they may be, and He will take your hand and begin leading you through each layer until you reach that sweet spot of blessed deliverance and freedom – that place where His eyes are all you see and those strongholds must bow at His feet. You know what’s uncomfortable? Having GERD (Gastroesophageal reflux disease). It’s not life-threatening or anything, but it’s a real nuisance. I try to abstain from eating super spicy and greasy foods (jambalaya is definitely a no-no), I avoid carbonation at all costs, and I have to deal with agitating heartburn. A few months ago, however, I found some healthy, whole wheat saltine crackers that effectively calm the acids in my stomach. So, I try to make a habit of taking a few crackers with me whenever I’m out and about just incase a thunderstorm erupts in my stomach. Well, today, I forgot to bring crackers with me; and wouldn’t you know it, I needed some. As my stomach began to behave like a washing machine, I sought the Lord. I said, “Lord, I forgot my crackers and I need my crackers. Please help me.” And oh, what a faithful God He is! After I prayed, I was walking down a hallway and felt led to stick my head into a room I was passing. Wouldn’t you know it, there was a tray – in this very room – full of crackers that someone had left there for whoever wanted them. I was overjoyed. I ate a few crackers and within minutes, my stomach was passified. What’s my point with this story? God hears your prayers. He hears every one – even the ones about crackers. He cares about all of your needs. Do you have a need today? I’m sure you do. Pray to the Lord. Cast your cares upon Him. He wants to help you. Remember, He can do what men can’t do! He can do the impossible. You can count on Him. When you order something at a restaurant, you put your faith in the waiter and the cook. You trust that the waiter will inform the chef of your order, the chef will complete it exactly as you ordered it, and the waiter will place it in front of you. While sitting at your table, do you ever think to yourself, “I’m ordering the fish and chips, but it’s very possible that the waiter and the cook will decide to change my order to chicken fingers.” Or, “Well, I may have placed my order, but I bet the the waiter and the cook will decide not to acknowledge my order and ignore me.” No, those thoughts most likely don’t run through your mind when you’re dining at a restaurant. So, why is it that when we pray to the Lord, we sometimes begin to doubt that our prayer is reaching His heart. We think that maybe He will answer by giving us something, but He may decide to completely disregard anything we actually prayed for. Or, we think that maybe He is just ignoring our prayers all together. If you have entertained these thoughts before, let me give you hope today. God does want to answer your prayers and He wants to give you the desires of your heart. And every prayer that proceeds from your heart reaches His. If you can put your faith in a waiter and a chef – trusting they will do what they say they will do, how much more should you put your faith in Almighty God? He can always be trusted. He never fails. Cast your cares upon Him and lay your whole heart in His hands. He is right there next to you, longing for you to call on Him. He hears your every prayer, even the ones that are still buried deep within your heart. There are coffee lovers, and then there are COFFEE LOVERS. Yes, I am the “capital letters” category. 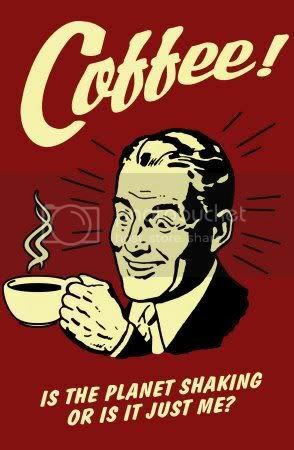 And, I like my coffee strong and the caffeine potent. Basically, I want my coffee to kick me in the pants. It helps me wake up in the morning…or afternoon. Well, coffee isn’t the only thing I want bold and vivacious – I want my life to be bold and vivacious as well. Apathetic, languid living is to me like a cup of cold, watered-down coffee that’s been sitting on the table for far too long. I mean, who would drink that and enjoy it? One of the things I’ve learned in life is that passivity makes one miserable. That feeling you have when you’re not really going forward or backward is agonizing. The problem is, life sometimes puts you in such a tornado of emotions and circumstances that you revert to feeling indifferent because it’s easier or because you feel it offers you some sort of protection from being hurt – or so you think. I would like to tell you today that you don’t have to feel that way any longer and you can heal from your wounds. How is this possible? Because God is BIGGER than your problems and He doesn’t want you to feel destitute anymore. See, God is bold and vivacious and also compassionate, loving, and merciful. He’s the mighty Lion of Judah that fights for you, protects you, and looks your enemies in the face and says, “Back away from my child! I will fight for them!” And, He is the gentle Lamb who wipes away your tears, calms your fears, and welcomes you into His loving arms unconditionally. He is everything you need and more. And God, only God, can drive any kind of apathy away from you! He wants you to get up each morning full of purpose, full of a never-say-die attitude. All you have to do is lay down your cares before Him and ask Him to give you direction. If you feel aimless, tell Him. If you feel like you just don’t care anymore, tell Him. He wants you to be honest with Him. He wants you to ask Him for help. Ask Him to take your life and re-energize it with His mighty power. He longs to see you become all that He made you to be and He’s ready to place His hands on your heart and breathe life back into your soul. When I get up in the morning, one of the things I look forward to the most is having my first cup of coffee. I have a certain way of preparing it, and when everything – creamer, sweetener, etc. – is stirred in just right, that first sip tastes absolutely remarkable. You probably have a certain routine in the morning, too. Something that gets your jets going, makes you feel refreshed. Well, have you ever thought about having a routine conversation in the morning? I dare say there is something we can do when we first wake up even before the coffee brews. What, you ask? Commune with God. Yep, have a conversation with the God of the universe, the Creator of the stars. Sometimes it seems unfathomable that we can open our eyes in the morning, put on our slippers, and say, “Good morning, Abba Father.” But, let me tell you, we can! And not just in the morning – we can talk to God anytime, anywhere! When I woke up this morning, I said to God, “Lord, thank you for how you are going to bless this day.” You know, He loves to hear your voice. He loves when you talk to Him. And He will speak to your spirit, too. And believe me, His voice is the most beautiful sound you will ever hear.